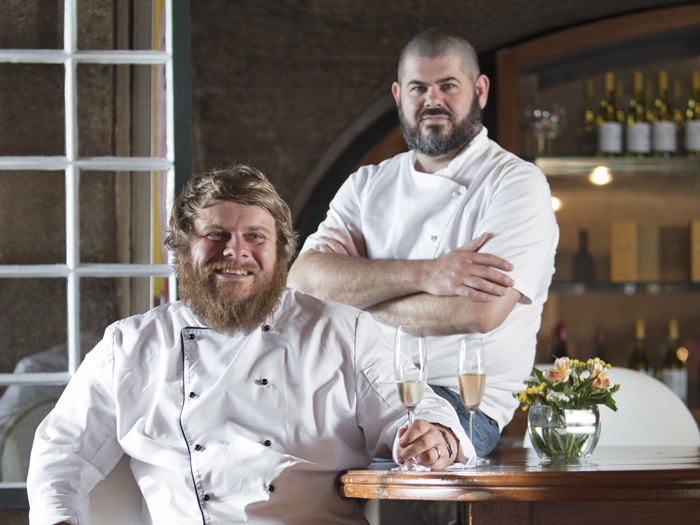 South Africa, Franschhoek, May 2018; FOLLOWING on 2017’s successful debut venture, Franschhoek’s Haute Cabrière wine estate, together with chefs Nic van Wyk and Westley Muller, sets out on a second season of Pop-Up restaurants to be hosted in Johannesburg, Pretoria, Durban and the Garden Route.The Pop-Up dinners offer guests from other parts of South Africa the chance to enjoy the highlights of a typical wine farm experience. A visit to Haute Cabrière in Franschhoek is ultimately a memorable day spent in excellent company, with fine food and wine to match. During this tour, diners can look forward to a six-course tasting menu, each course paired with a different wine to create a unique and unforgettable taste experience. Menu highlights include pan fried Patagonia calamari with black tomato sauce and seared scallops, paired with the Haute Cabrière Unwooded Pinot Noir, and finishes on a high note with a chocolate torte with amaretti crumbs, candied pecan nuts and salted caramel popcorn, accompanied by a glass of Pierre Jourdan Ratafia. Reservations should be made directly with the venue and all dinners are priced at R595 per person which include a six course menu paired with wine. The same menu will be served at each venue with the exception of Osa Restaurant, which will have an Indian inspired menu.